Inspired by useful Cross-platform Portable Firefox 1.5 (Mac/win) and by PortableApps.com (win), here is the popular Mozilla Firefox web browser packaged so you can carry around with you on any portable device, USB thumb drive, iPod, portable hard drive, memory card, other portable device (also on your internal hard disk) as long as it has 75 MB of free space and use on any Mac OS X computer, taking your bookmarks, extensions, history, cookies, and saved passwords with you. To update download last Firefox version and copy it in Resources folder inside Portable app bundle (ctrl+Clic - Show bundle content). Please provide me "Read Me.txt" tanslation. Drag the "Portable Firefox OS X" folder to your portable device, USB thumb drive, iPod, portable hard drive, memory card, other portable device (also to your internal hard disk) as long as it has 57 MB of free space. Clicking "Portable Firefox" will open Firefox from your portable device, wait a while before Firefox start. If a local copy of Firefox is running an alert window allow you to quit it. 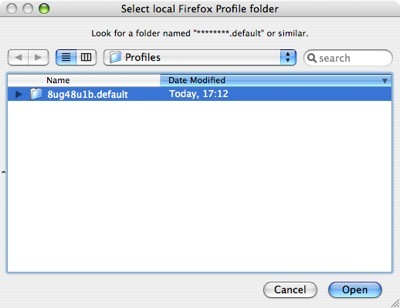 You can copy your local Profile folder to Portable Firefox when "Copy local Profile" window ask you. So, if you wish to use your bookmarks, add-ons, history, personal data and preferences you already have on your system, just click "Copy" when prompt, and select the folder "/Users/<username>/Library/Applications Support/Firefox/Profiles/.default/". Read also Portable Safari Copy Preferences page. Remove file "Portable Firefox.app/Contents/Resources/CopyPref_Done" to copy preferences next time you open Portable Firefox. Know issue: when you upgrade your profile from a version prior to 2.0, Firefox restart immediatly, this show the "Portable Firefox quit with success" popup window even if Portable Firefox is still running. If you wish to use your bookmarks, extensions, history, cookies, and saved passwords you already have on your computer, copy the content of the folder "/Users/<user>/Library/Application Support/Firefox/Profiles/.default/" to "<your_volume>/Portable Firefox OS X/app/profile/**" folder. You can download the "OPEN Portable Firefox.app" AppleScript only if you wish to save your previous Portable Firefox, without need to dowload all script and app bundle you already have. This .dmg contains ONLY the "OPEN Portable Firefox.app" AppleScript. You can drag "OPEN Portable Firefox OSX" icon in your previous "Portable Firefox OS X" folder that contains Firefox.app and your "profile" folder. As the "profile" folder path is changed, just drag it in the "app" folder. You can delete "START Prtable Firefox.command". Do a backup of your "profile" folder copying/renaming it. Portable Firefox OS X start both from external and internal volunes (hard disk). You can syncronize your portable and "stable" Firefox simply by coping "profile" folder. Portable Firefox OS X script source code page. Profile copied if desired with folder select option. Portable Firefox ask to quit application already running. Portable Firefox is wrapped as application package with Platypus. Spanish, Dutch, Swedish, Chinese (Simplified) languages available. New "OPEN Portable Firefox OSX.app" icon. This little work was made possible by Cross-platform Portable Firefox 1.5, and with useful clues by Marco Moisson of Tevac forum, and hayne of Macosxhints forum.